The list of things to do in Big Bear is huge and it is the perfect place for a simple, low cost weekend getaway from golf, fishing, mountain biking to this years list of events, Big Bear resort is the place for family vacations. Many people think of Big Bear as a winter resort, however summer is the more popular time of the year as there are more things to do. Big Bear has filled the lake with things to do and activities that are fun for the whole family. The summer days are warm and filled with sunshine and evening nights are cool and comfortable. It's a great time to be in the mountains. Golfers will love the Bear Mountain Golf Course. The ball flies further at 7000 ft altitude so your game is immediately improved when you play. The golf course is set beneath Bear Mountain. It is a beautiful well maintained course with homes that line the fairways. It is just a short drive when you stay near the Big Bear village area. How can you not love to put your pole in the water and Fish in Big Bear? There are marinas to rent boats and the trout is fun to catch and delicious to eat. Fishing is probably the 2nd most popular activity. You can bring your own boat, rent a boat from one of the marinas, or just go stand on the side of the shore. You'll even find lodging that is lake front, so you could go and put your pole in the water just outside your back door! Did we say trout...? Delicious. Every summer Mountain Biking in Big Bear grows as the Snow Summit resort area grooms their ski hills for mountain bikers and this season it looks to be long and wonderful. Now that Mammoth owns Bear Mountain, you know the bike park is going to enlarge, have great runs with cool obstacles for challenging rides. Of course, beginners have a great time too and it is a nice family place to get your training wheels off and go for it. And who can resist the scenic Sky Chair ride at Summit. Ride it to the top of the mountain and see the killer view... don't forget your camera. Likely one of our favorite activities, for those that prefer nice views and strolls. The scenic sky chair takes you to the top of the mountain for those Kodak moments, and then you can walk down at your own pace. Downhill walking... still great exercise, and you're outdoors breathing fresh air. And who can resist just renting a boat from a local marina, and buzzing around the lake at top speed or on jet-ski, or paddling on board! 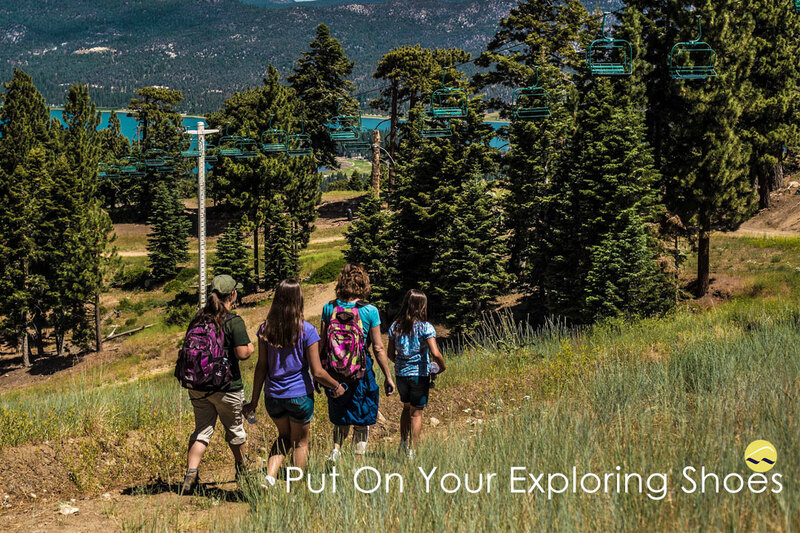 Yes, Big Bear is a great place for family fun this summer. So come on up and get some fresh air!